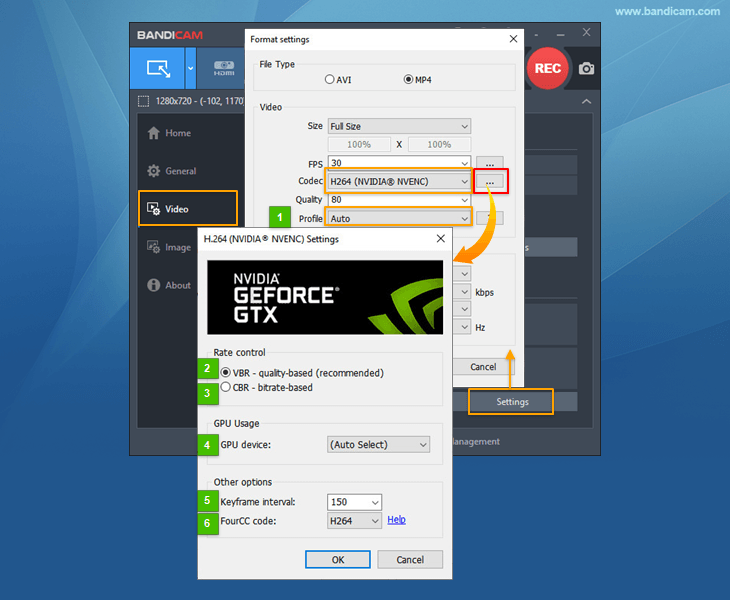 If you use a high-end NVIDIA graphics card and install the latest NVIDIA graphics card driver, you will be able to enhance the recording ability of Bandicam by using the GPU of the graphics card. If you use GTX 950 series or higher graphics cards (Maxwell, GM20x), you will be able to use the Nvidia NVENC HEVC(H.265) encoder which is better at compression than the NVENC H.264 encoder. Go to https://www.geforce.com, and download/install the latest Nvidia video card driver. Choose the "H264 (Nvidia® NVENC)" or "HEVC (Nvidia® NVENC)" option. Click the Settings button under the Video tab, then choose the "H264 (Nvidia® NVENC)" or "HEVC (Nvidia® NVENC)" encoder. Profile: If you choose "H264 (NVIDIA® NVENC)", the Profile selection menu (Auto, Main, High) will be shown. Nvidia® NVENC encoder is available in Windows 7, 8, and 10. If you use 'Windows XP' or 'Windows Vista', the "H264 (Nvidia® NVENC)" menu will not be shown. Desktop GPU: Geforce GTX 600 series, QUADRO/TESLA(K series) or higher graphics cards. Laptop GPU: GTX 660M, 670MX, 675MX, 680M, 700M or higher graphics cards. Desktop GPU: Maxwell GM20x (GTX 950/960/970/980/Titan X), Pascal GP10x (GTX 1030/1050/1060/1070/1080/Titan X), QUADRO/TESLA(M/P series) or higher graphics cards. Laptop GPU: GTX 965M, 970M, 980M or higher graphics cards. 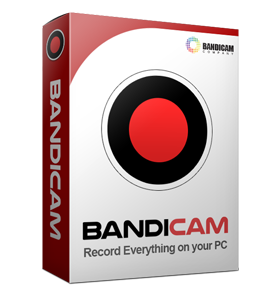 Nvidia® NVENC encoder is available with the latest version of Bandicam. Nvidia® NVENC H.264 encoder is available from Bandicam 2.0.0, and Nvidia® NVENC HEVC encoder is able from Bandicam 2.4.0 with the MP4 container.